The man jumped out of a moving ambulance and tried to hide in a church. Investigators are trying to unravel the mysterious circumstances that lead to the shooting death of a man who, after being released from jail, leaped out of a moving ambulance and later stabbed an officer with a butcher knife. The bizarre chain of events started about 3:00 p.m. Saturday after the suspect posted bail at the Twin Towers jail. The Los Angeles Police Department said an ambulance was taking the 35-year-old Hispanic male to have a minor injury looked at County-USC Medical Center. For reasons that were not yet clear, the man jumped out of the moving ambulance near Mission and Richmond streets. 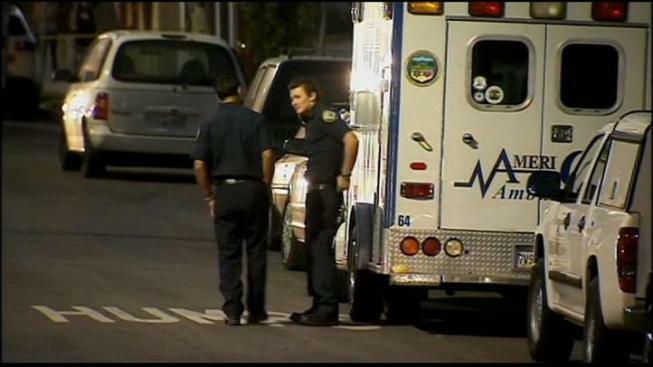 Medics stopped to help but the man assaulted them and fled on foot, the LAPD said. "Really the mystery is why this guy jumped out of a moving ambulance when he was really free to go," said LAPD Commander Andrew Smith. After a five mile chase, the suspect broke into El Divino Salvador Presbyterian Church at 515 Escandia St. and attempted to hide, the LAPD said. Police eventually sent in a dog after the man and then a search team confronted him. Armed with a ten-inch butcher knife from the church rectory, the suspect allegedly stabbed an officer through his left bicep, the LAPD said. Another officer fired at least one shot, killing the suspect. "No one really knows why he jumped out of the back of the moving ambulance and assaulted the ambulance attendant and then took off running and hid inside this church," Smith said. "Our detectives are looking into it to try and come up with an answer to that." The name of the suspect was being withheld pending notification of his family. An autopsy will be performed.